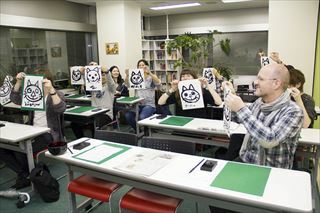 This activity "Sumie Class Experience" is available on this video by lonely planet. Please check them out. 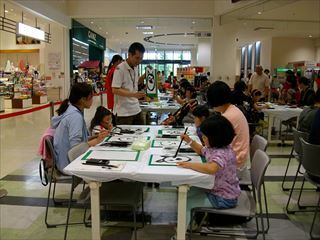 In this activity, you'll be taught how to paint bamboo, san-sui landscape, and more in sumi-e painting. You'll paint 4-5 pieces in an hour in the class. 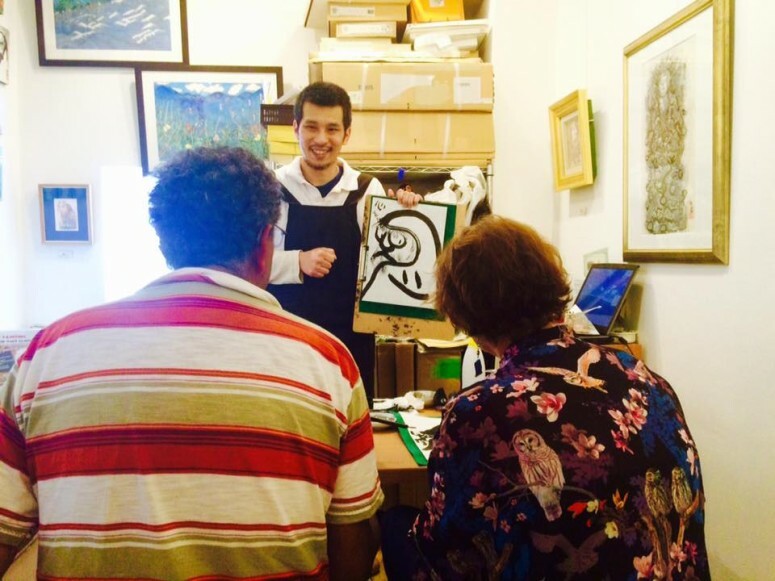 There is no mistake in sumie painting, especially in the sumie class. Sumie can make you free from all including sadness and bad mood and so on. 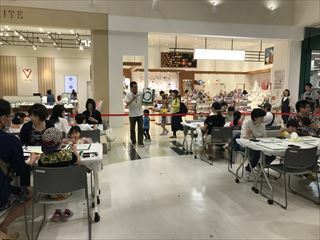 Both adults and children can enjoy painting together at the same moment. It also makes you go over the all walls of generations, nations, genders, and more. Sumie is easy and simple and interesting, so we can do it easily. In this point, it could be called Momentary Painting. That's because children can paint 10-20 paintings in an hour and they can keep their concentrations in the entire class without any boring. That's amazing things. Please check out about Children in usual. You can find the sumie class great. Anyway, Sumie is so fun and easy, and simple. That makes you have fun. That makes you glad and happy. That makes you smile naturally. Why not do it? Actually, there is a secret in a human figure of paintings...A mystery will be solved in the class! Also a three years old girl was so excited and had so much fun in the class. She had concentrated to draw for about two hours. That was incredible! This is not just a lesson. It's an entertainment!! Sumie class Experience is not just a lesson. It is near an entertainment. That's why it is for all ages. 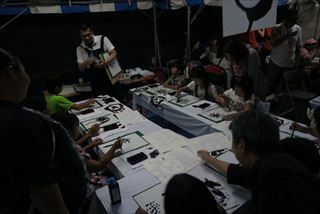 Children are also able to enjoy sumie painting with adults together at the same moment. Of course, if you were any painters or artists, you would be satisfied with it. We had many classes for artists in any materials. 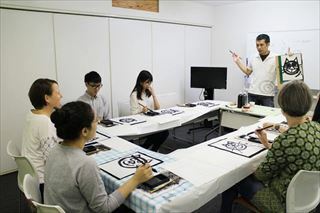 If you have an interest of it and if you want to learn it more deeply than the class Experience, you should take another class, which is called sumie class Master by Toyokuni Honda. If you want just to try it, it would be nice for you. 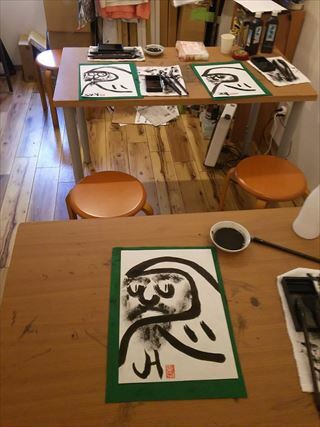 Anyway, this class is just an entrance to have an interest of sumie painting. Please join the class Experience!! 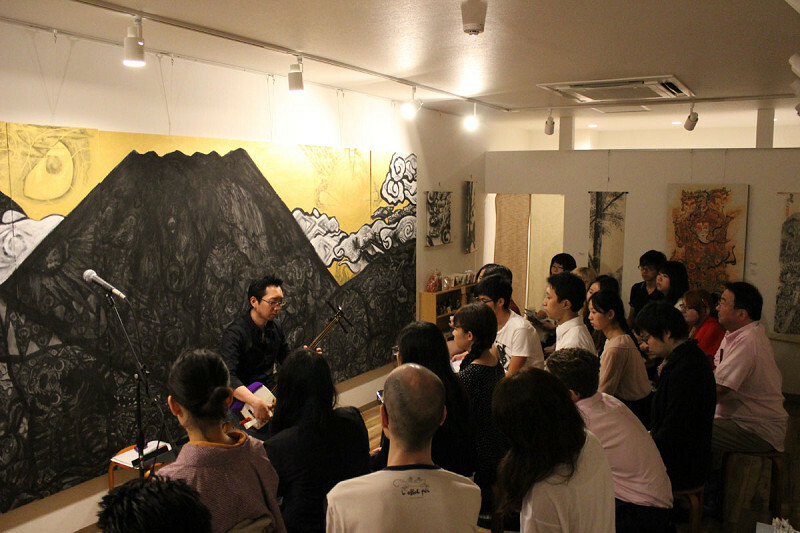 Over 200 people from a whole world enjoyed SUMIE in over 100 times of the classes!! Not only adults but children enjoyed painting very much. 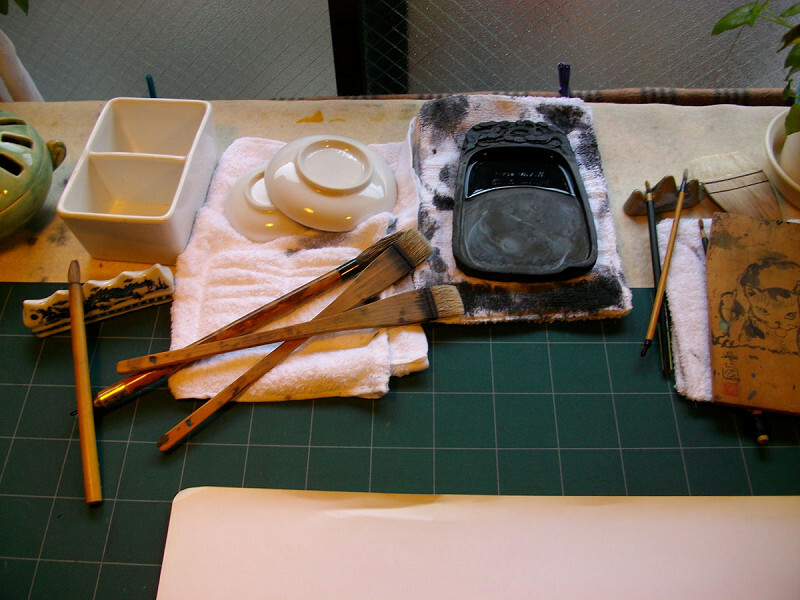 Indian ink and rice paper and Janapanes brushes,these gives you a great experience. Stroking a lot of lines makes you concentrated naturally. Expressing in sumie way makes you happy. In which there is no differences between ages. It is for any ages. After finishing the class, they would get something new and great. Please make a reservation by two days before. Mostly, the class is one on one. Privated. For all ages. I welcome your families! We take care of everything to paint. And please come in older clothing - Your clothes may get some paint on them. English speaker is available. When you make a reservation for the sumie class, please let me know about following items on email. 1.Your Name, 2.Numbers of persons, 3.Date and starting time. *Please set your security app enable to get email from nekomachi.com before your setting email. *Please set your security app enable to get email from nekomachi.com before you send email. 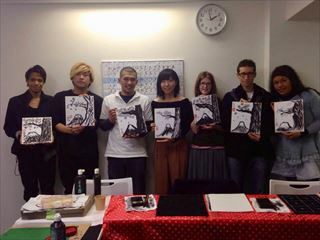 I started a sumie class Experience for international people on April 2015. 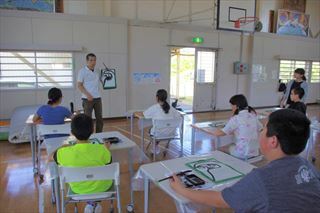 I have participated in a lot of sumie classes of the Master Toyokuni Honda as a director or a facilitator since 2009. I turned the class into not only lesson but also entertaining one. I made it simpler and easier than father's class. That's why particularly the beginners of painters and tourists love this class. 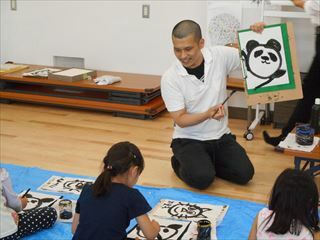 Not only adults but also children can have so much fun with sumie painting easily. Enjoying first, anyway paint something. I want to remove all of sadness away from the world with sumie painting. Hi I'm Yuta! 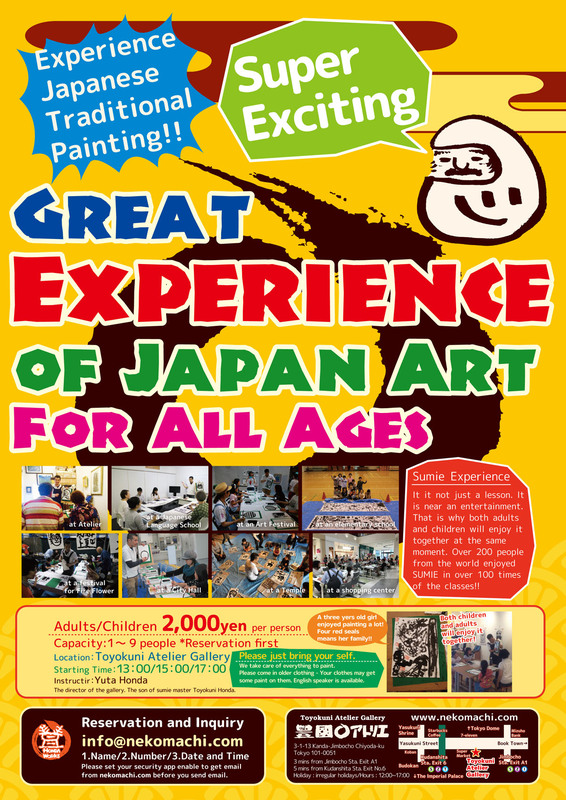 Anyway I want to see you and share fun of sumie painting and Japanese calture with you at the gallery. I want you to come just to talk with me about everything and anything. Please make a local friendship with me! 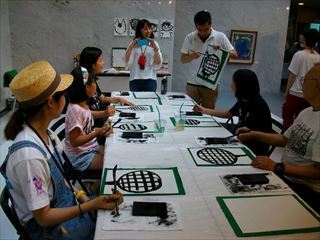 Sumie is known as Ink Wash Painting or Black And White Painting in the world. 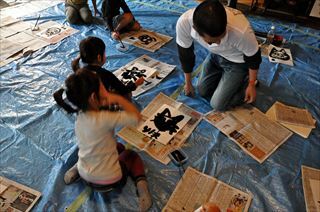 It's the one of the traditional ways of painting in Japan. 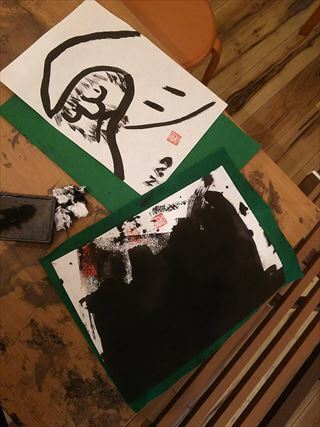 Sumie is painted in Indian Ink with brushes on Japanese unique paper. Usually, it is expressed drawing lines and making gradations and a few coloring by Japanese pigment colors. When Sumie painters express something, they are trying to make the motifs symbolized simply, because there is not any lines in the world indeed. We can feel lines but no lines exist. So they need to symbolized anything they paint. That is very interesting point of Sumie painting. 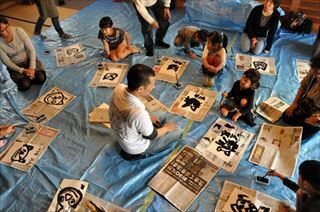 That means when we do a sumie painting, we paint all in our heads before expressing. We complete it at once in our heads. That's why children also has so much fun with adults at the same moment. 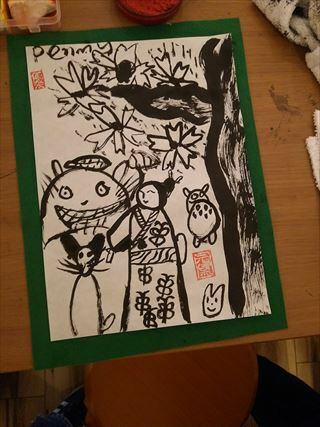 I found it a few years ago, so I can understand I should have the sumie class Experience and Doodle for all over the world. 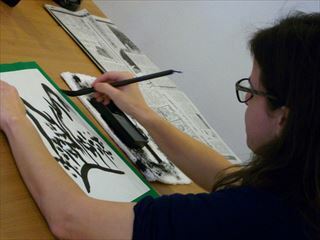 Sumie Doodle is painting in indian ink(Sumi) with Japanese brushes(Fude) on a rice paper(Washi). That's so simple and easy. I have enjoyed it with a lot of children and the visitors to this country around everyday. It's a great time for children. They have so much fun and make a bright smile. They can release off their sadness and some negative feelings at the moment. They will smile and smile in painting and after painting. And they make the chain of smiles with their family and friends and people around them, connecting with smile and smile. It's not easy to control to draw lines with a fude brush. 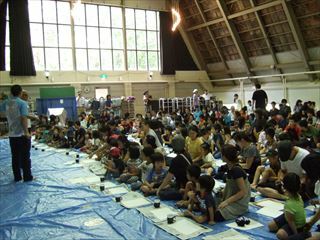 That's why they children and adults can begin to paint Sumie Doodle from the same starting line. That makes them so much fun. In this point, no differences between adults and children. Adults can get a lot impacts with big imaginations and creativities of children. This is the most wonderful way to have communications each other. 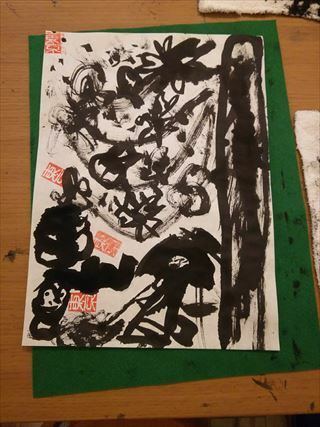 Sumie Doodle is simple but profound painting. It's also interesting. It would be the mostly simplest and deepest enjoyment in the world. 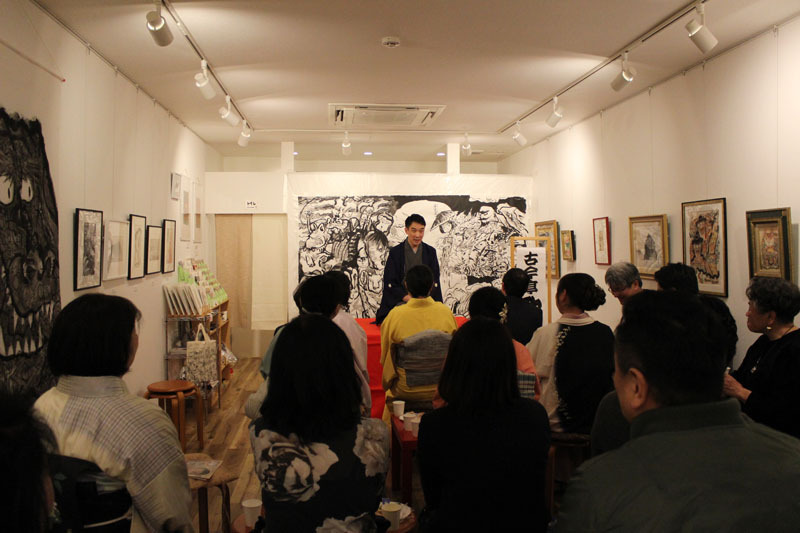 Doodle and uncontrollable lines would attract you with painting more and more. Do you feel it wonderful thing that we all of people in the world are painting the same one painting at the same time? When all of the guests get back their home, they would smile. They all make a happily smile. As children got smile, their parents would also have a smile with seeing them laugh and smile. After getting back their home, their grandparents would also make a smile with their smiling. It's the Chain of Smile. Smile produces smiles. It would be a small thing, but important. 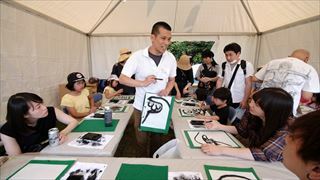 We can have Sumie Doodle classes EVERYWHERE. Please don't hesitate to email us to get more informations if you have an interest of this. 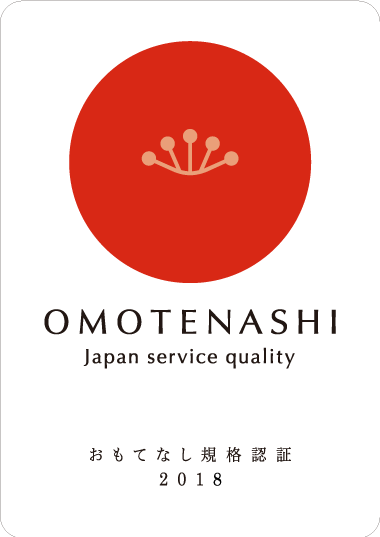 Our purpose is spreading some fun with sumie on a traditional culture of Japan. Sumie Doodle can make your sad mood happy and fine in 15 mins. And it would save the world!!! Let's come together with us for our future!! A doodle has a great power, not only Sumie but also other materials. According to “Psychology Today”, doodle would make some bad mood better around 15 minutes. It would make the painter get relaxing. And more GOOD things was confirmed on it. *And more activities available directed by Yuta Honda. 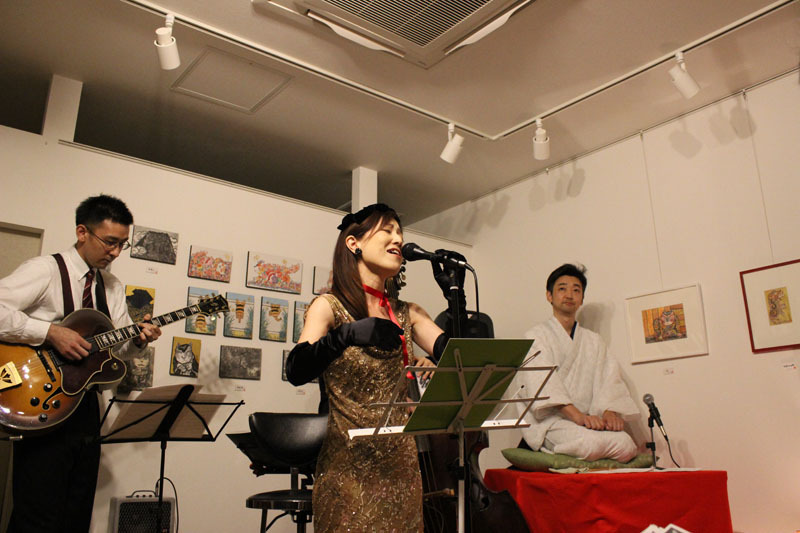 For example, the sumie events in Tohoku Japan areas and in Laguna Beach Art-A-Fair in CA, USA, and more. 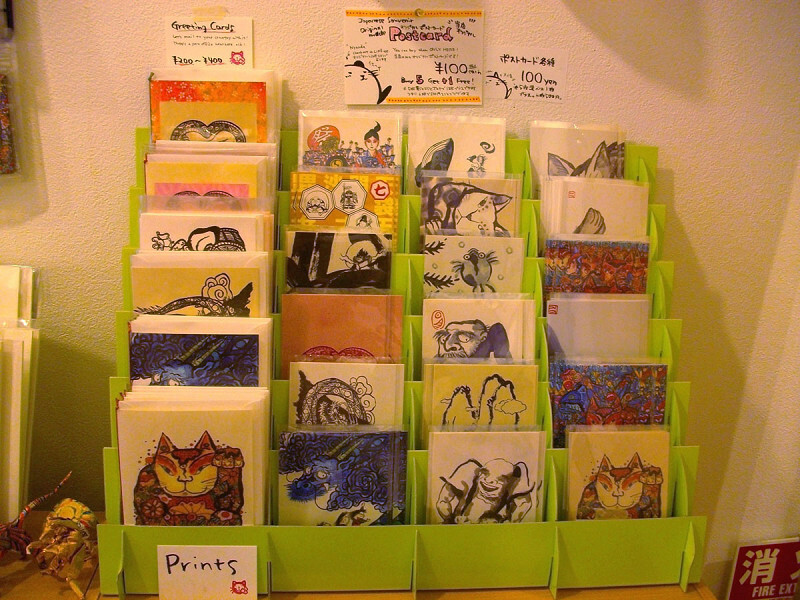 We have a lot of Sumie ink wash paintings, woodcut prints, paintings on the rock, T-shirts and more gifts of Japan. 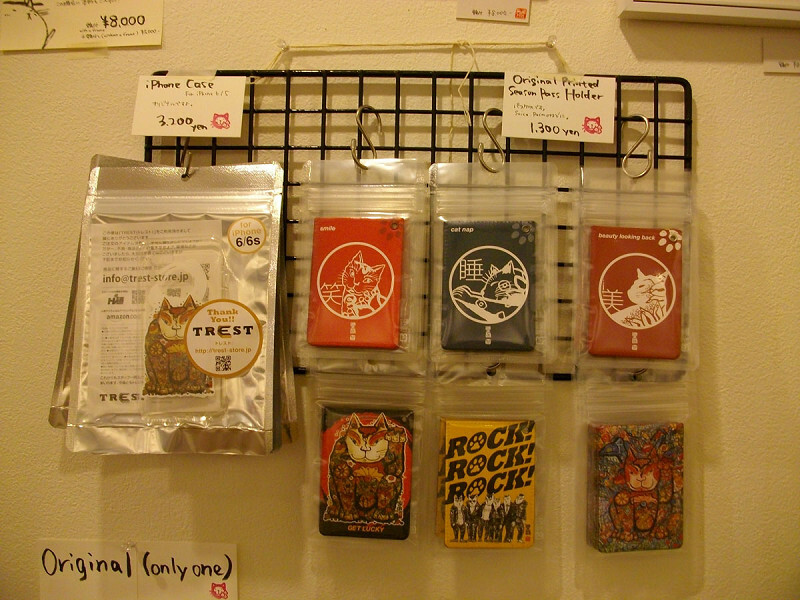 Also you can get postcards, mug cups, picture books(English subtitled), iPhone case and more. Let's get them as Japanese souvenir. And you can have some fun with sumie class Experience. 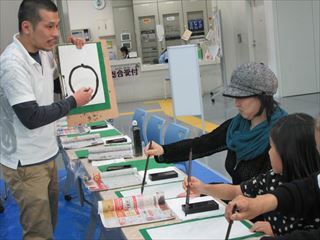 You can be a sumie painter easily. Of course children can have fun. Let's come enjoy it with all your family! 5 mins by walk from Exit No.6 of Kudanshita Station. 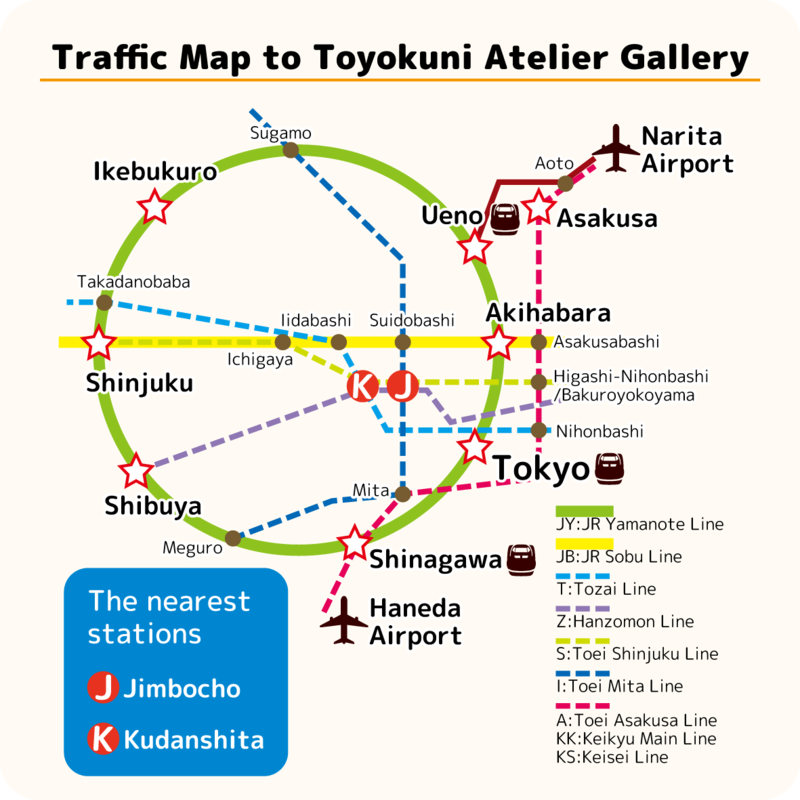 3 mins by walk from Exit A1 of Jimbocho Station. (c)HONDA WORKS, 2019, All Right Reserved. Unauthorised reproduction,hiring, lending, performance and prohibited. Since 1999.